When winter hits Chicagoland, streets and sidewalks get hit with a mixture of road salt or other ice melting products in an effort to make getting around easier. While it may be helpful outdoors, indoors spaces face a problem unmatched by other times of the year. As salt and melting products are brought in via shoes and boots, residue begins to build on floors. More than being unattractive, this mess can cause damage to office carpets and other flooring surfaces. Overall, one of the single biggest contributors to carpet stains and deterioration is salt. The white crusty mess that appears is a chemical mixture tracked in by employees. Water mixes with the calcium chloride and magnesium in salt products. As it dries and builds up, staining begins. Even if your company has a nightly vacuuming, it is difficult to pick up the deposits because road salt contains a high alkaline content that makes it stick in the carpeting. If the salt is not removed quickly, it eventually breaks down the fibers, causing permanent damage to the carpet. While other flooring surfaces are easier to clean up, damage from tracking in salt effects them too. Left too long, salt can damage floors. Deposits can get into stone and masonry floors. This deteriorates the surfaces and pitting can be seen over time. Salt will scratch wood flooring and can strip off coats of urethane. If this happens, additional damage can be done by the dirt and moisture that gets into the exposed areas. The same type of damage can occur on laminate flooring. If there are no cracks in linoleum, this surface typically holds up well during the winter months. If salt gets under damaged linoleum, bumps will appear where salt is trapped and crushed under foot. Tile is the best flooring to withstand salty tracks. 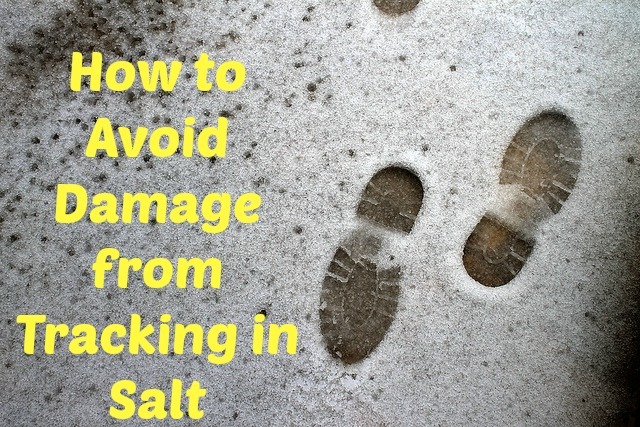 Knowing how to avoid indoor salt damage can save money and headaches. Vacuuming and mopping on a daily basis helps prevent damage to floors. Because salt and ice melter mixtures have higher pH, removal of the substance needs to be done by cleaning with a neutralizer. Throughout the winter, consider hiring a professional cleaner to come more often to do a more thorough cleaning to remove salt build up before it causes damage. In addition to the cleaning, a professional will be able to assess the damage done to the floor. Stripping and waxing may be necessary to best protect your investment. One of the easiest ways to keep your floor from being damaged is to have preventive measures in place when the weather gets wintery. Put mats near entryways. This way the salt that gets tracked in will first hit the mats and not the floor. Provide areas for changing. Some companies have the space to put benches or chairs near the entrance. Encourage employees to change their footwear before going to their work area. Find salt alternatives. You cannot account for every step employees take outdoors, so you do not know what will stick to boots and shoes. You can, however, be responsible for areas nearest you. Using salt alternatives on sidewalks and parking areas on your company’s property can help lessen what is tracked into the building. There are winter safety solutions that are more “green” because they are free of chloride, the chemical in salt. Urea, for example, is a natural ice melter that is better for your surfaces both inside and out.